David Toms spent a considerable amount of time in the top 10 of the Official World Golf Rankings (over 175 weeks between 2001 and 2006) and ranked as high as 5th in 2002 and 2003. 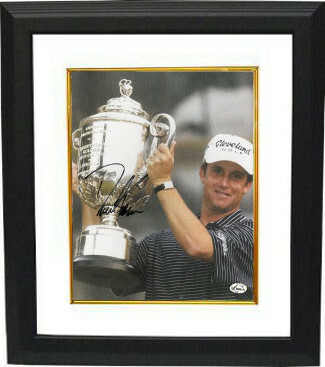 He has won one major championship, the 2001 PGA Championship at the Atlanta Athletic Club, and a total of twelve events on the PGA Tour. David Toms has hand autographed this 8x10 Color Photo. FI Hologram and Certificate of Authenticity from Athlon Sports. Custom White Mat and Premium Black Color Framed as shown.